5211 EP PENRHYN (1982) Scout emblem*. Tropical flower*. 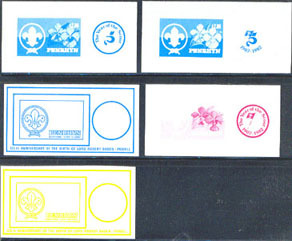 Set of 5 progressive proofs in unissued color combination. Scott No 218, Yvert No BF45. These proofs are from the archives of the Fournier Vittoria Security Printers of Spain. Only a very few exist! 5212 EP PENRHYN (1982) Scout emblem*. Tropical flower*. Set of 3 progressive proofs in issued color combination. Scott No 218, Yvert No BF45. These proofs are from the archives of the Fournier Vittoria Security Printers of Spain. Only a very few exist!